Congress can take away our freedom, but they’ll never take our unregulated booze slushies. For as long as humans have existed, we’ve enjoyed a good, strong drink. From Neolithic beers to the wines of Jesus to whatever the hell Four Loko is, the art of booze-making lies deep within our bones. And the millennia of perfecting the nip has led us, we the people of 2014, to a singular and glorious conclusion: the Phrostie. In its short life, the Phrostie has risen from novelty beverage for Brooklyn hipsters, available (illegally) only through Instagram, to the blacklist of a U.S. senator. That’s right: This week, New York Sen. Chuck Schumer vowed to rid his state of this colorful, delicious plight. The unwanted attention caused the mysterious Phrostie entrepreneurs to shut down their official Phrostie Instagram account, leaving potential customers to wallow in a Phrostie-less purgatory. The Phrostie, it seems, is dead less than a month into its delectable life. But this is America, dammit! Land of the free. Home of the booze-loving masses. Are we going to let The Man deprive us of our scrumptious hooch slushies? No, of course not. We’ll just make them at home. Here’s how. The official recipe for Phrosties is a secret. But it’s not hard to figure out. Our best guess? 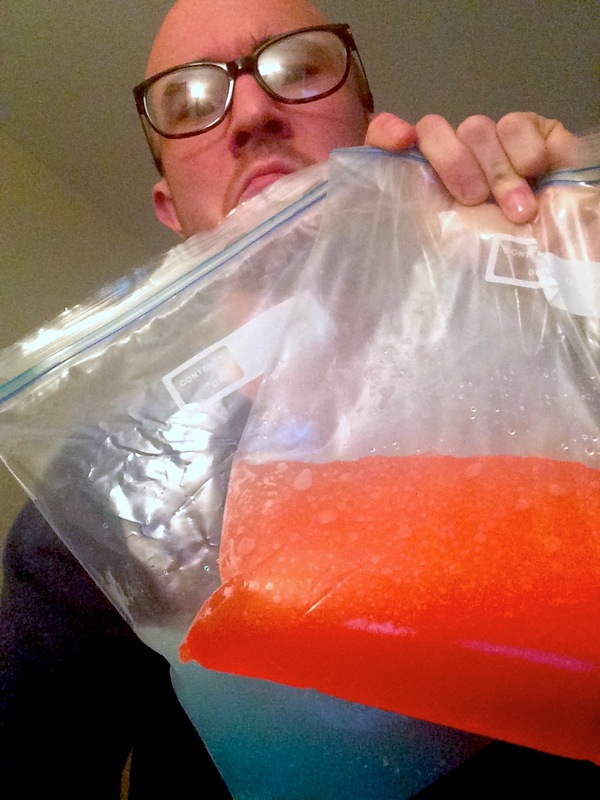 Kool-Aid, ice, and high-proof liquor. Ideally, you’ll use Everclear—yes, the gutrot that nearly killed you in high school—just to keep it extra classy. But any powerful spirit will do. We went with 100-proof Smirnoff vodka because our local liquor store has crappy selection. Still, it smelled like regret and did its job flawlessly. If you want to get creative, you can try some swill like Malibu or Tequila. For the best results, however, stick with something that allows the nuances of the Kool-Aid to dance along the palate unfettered by whatever dumbass idea you had. Based on our highly scientific tests, it’s best to mix a super-concentrated batch of whatever Phrostie flavors you decided to whip up. That means doubling the sugar to two cups, and doubling the Kool-Aid packets. It’s not necessary, but it’ll add extra color to your Phrostie and make you feel better about life in general. As for alcohol content, it’s entirely up to you. Do you want to get crazy? Then go for around seven or eight shots (ounces) per blender-full of Phrosties. Hell, make it 10. We used about five in our mix (per layer—see below), and that worked out just dandy. The most important tool in Phrostie making is the blender. Without it, you’ll be stuck crushing ice by hand, infinitely. If you don’t own a blender, borrow one. Or hit up the Salvation Army. Actually, don’t go to Salvation Army—it’s run by bigots. And the last thing we need is homophobia tainting our Phrosties. Just find a blender however you can, and leave the taints out of it. Store-bought ice, we found, works best due to its blendability—though you’ll have fine results with whatever cubes are in your freezer. (You might need to stir your mix mid-blend to get out all the chunks, however.) Just know that you’ll probably need a lot of whatever ice you’re using. So, if you have one of those fancy refrigerators with an ice dispenser, you’re golden. Pat yourself on the back for your excellent forethought. If you’ve had a Phrostie, or simply seen pictures of them, you know that they generally have different layers of color—that’s what makes them so fun and special! This is completely unnecessary. But if you want to stay authentic, you’re going to need to make multiple batches of Phrosties, then layer them on top of one another. To do this, pour a base layer first. We recommend putting glasses (jugs, buckets, whathaveyou) containing the first layer in a freezer while you make the additional flavors. Those of you making Phrosties with a single blender, as we did, will have to make one flavor, then the next (then the next, if you want to be all overachiever about it). So just repeat all the steps above until you have the combination of flavors you want. And that’s it! Now sit back, throw on some band nobody but you has heard of, and enjoy your final moments of icy consciousness. You’ll likely find that it’s virtually impossible to make single-serving Phrosties. Which means you, like us, will have to figure out something to do with the remaining mix. (Drinking it all by yourself is an option—if you’re a goddamn maniac.) So make sure you have friends around to help polish off your stash. Or, if nothing else, there’s always Instagram. Have your own Phrostie recipe? Share it with us, and we’ll add the best ones to the mix. Better yet, head on over to BuzzFeed for their version.